A quiet little mountain town is hiding a big problem. 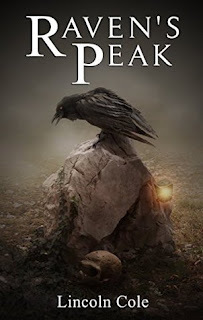 When the townsfolk of Raven’s Peak start acting crazy, Abigail Dressler is called upon to find out what is happening. She uncovers a demonic threat unlike any she’s ever faced and finds herself in a fight just to stay alive. This is my first supernatural thriller. Somehow, I don't like this genre as everything written is unbelievable. But, this book caught my attention due to gripping narration and suspense. The story is about Abigail, a hunter of supernatural elements in the world, who is appointed by a secret society. While she goes to a small town 'Raven’s peak' to enquire about supernatural activity in the camp grounds she remembers her past and she has to attack a dangerous demon not only to save the people inRaven's peak from becoming crazy but also to know an important truth about her foster father and mentor. Will she be able to kill that demon with her skills? How a stranger 'Haatim', whom she rescued from a danger is helpful? What other secrets she will find in this quest? This forms, the remaining story. This book is part1 of the series 'World on Fire'. The plot and narration are interesting. The book cover is fantastic. Actually, I loved the book in bits and pieces. I loved the episode of Abi remembering her past, Abi giving the information on Ninth circle to Haatim, the boy possessed by a demon, Haatim and Abi exploring the caves etc., Since this is part 1, I will get better continuity after reading the second part when available. Overall, it is a good book, But, It didn't meet my expectations of a fast paced thriller. But, plot and character-wise, it's dealt perfectly well. Ps: I have received the book from the author in exchange of an honest review and this is my unbiased opinion on the book. Lincoln Cole was born and lives in Columbus, Ohio. He is twenty-nine years old and has been writing novels his entire life. He works in the IT industry developing web applications and writing software.